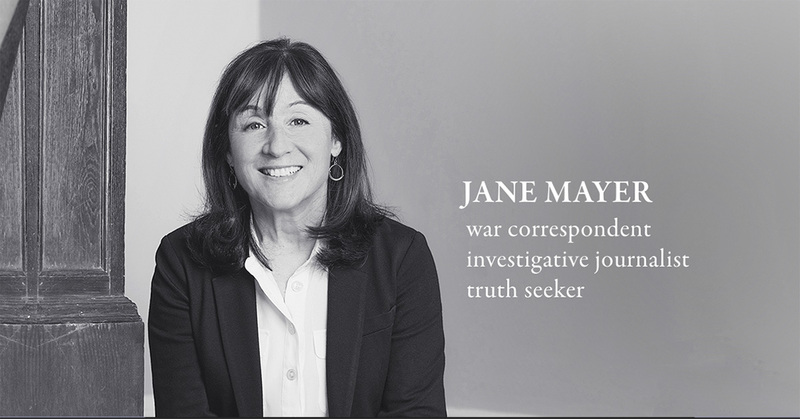 Award-winning journalist and best-selling author Jane Mayer will visit campus on March 19, 2019, to deliver this year’s Wilson Lecture, which is entitled “Fake News and Alternative Facts: The War on Truth.” This annual event brings prominent speakers to campus to explore the issues of the day. Endowed by Carolyn A. Wilson, a journalist and war correspondent and a member of Wellesley’s class of 1910, the Wilson Lecture Series ensures that generations of Wellesley students are familiar with the most important public figures and issues of their time. In 1962, Katherine Anne Porter, best known for her novel Ship of Fools, delivered the inaugural lecture. Over the years, the Wilson Lecture has been given by some of our most innovative and influential thinkers, such as Elie Wiesel, Ruth Bader Ginsburg, Toni Morrison, Chinua Achebe, Paul Farmer, William Julius Wilson, and Al Gore, among others. Mayer was the Wall Street Journal’s first woman White House correspondent, is a best-selling author, and currently serves as the chief Washington correspondent for the New Yorker, where she covers politics, culture, law, and national security. When Wellesley’s Committee on Lectures and Cultural Events (CLCE) put out the call for Wilson Lecture nominations, Stacie Goddard, professor of political science, and Irene Mata, Barbara Morris Caspersen Associate Professor of Humanities and associate professor of women’s and gender studies, suggested Mayer. The two professors recently answered some questions about their recommendation. How does Jane Mayer reflect the vision Carolyn Wilson had when she established the Wilson Lecture? We wanted to nominate someone who would reflect the spirit of truth-seeking embodied by Wilson’s own work as a journalist while also addressing an issue that is currently at the center of public debate: freedom of the press. As guardians of democracy, journalists help report stories that often stand in opposition to government narratives and authoritarian distortions of reality. We are living in a world where the work of responsible journalism is constantly undermined by the proliferation of misinformation and unverifiable claims circulated as evidence. We view Mayer as part of a group of professional journalists who work hard to report stories based on research and tangible evidence, who write stories that often put them in direct opposition to those in power, and who are often targeted by those whose power they question. When we first nominated Mayer, we did so with an understanding of the urgency to acknowledge the danger that journalism and journalists are increasingly facing in our current moment. Unfortunately, that urgency has only increased, as evidenced by the Capital Gazette shooting in June and the execution of journalist Jamal Khashoggi in October of last year, just to name two. In fact, Time magazine named “the guardians and the war on truth” its 2018 Person of the Year. Knowing what we know of the importance of a free press, we can’t think of a better way of honoring Wilson’s legacy than to invite Mayer, a fellow journalist and war correspondent, to give the 2019 Wilson Lecture. In your nomination of Mayer, you said she serves as a model for creating knowledge based on critical thinking and responsible research. Can you expand on that? We see Mayer’s work as a model for responsible investigative journalism, the type of journalism that requires in-depth research based on a search for answers. That quest is based on critically thinking about how structures of power connect and influence our democracy and everyday lives. One thing that stands out about her reporting is her tenaciousness. Whether she is writing about the growth of the security state after 9/11, Russia’s interference in the United States elections, or the exaggeration of voter fraud, Mayer has clearly done her homework. While she is not an academic herself, she often relies on academics as her sources, and she does an outstanding job of translating academic work for a public audience. Her recent work on Russia’s interference in the elections really demonstrates this talent. In one New Yorker article, Mayer draws attention to a social scientist who has used intense data gathering and complex statistical analysis to gauge whether Russia’s interference actually influenced the election. In another, she asks historians to put the election interference in its larger social and political context. In doing so, she’s demonstrating to readers the value of research and expertise, and making it accessible to a nonacademic audience. What do you hope Wellesley students will take away from listening to and learning about Mayer? That work that matters is worth doing—even if it’s difficult. Like Wilson, Mayer has broken through several barriers that kept women out of the newsroom and the correspondents’ office. It wasn’t easy, but the importance of the work is what makes all the effort worth it. Moreover, her resilience is remarkable. Her reporting has come with costs, including, as the New York Times reported in 2016, some fairly intensive smear campaigns against her work. We hope students will find their own version of “work that matters” and pursue it with the courage and intelligence we know they all possess. The event will start at 5 p.m. in the Alumnae Hall Auditorium; doors will open at 4:30 p.m. Tickets are required (either bring a printed copy of your ticket or show it on your mobile device). This event is free and open to the public and registration will open on Wednesday, February 6 at 9 p.m. Attendees may not bring any large bags, backpacks, or signage. Attendees are invited to a reception in the Alumnae Hall Ballroom immediately following the lecture.